A group of around 6,000 people left the Gare du Nord railway station and were to team up in central Brussels with around 1,000 marchers who started off from Molenbeek, the rundown Brussels district that has gained an unwelcome reputation as a jihadi haven. The rally — “A march against terror and hatred” — was organised by civil groups, who had hoped for a turnout of 15,000. “When our fellow citizens, defenceless civilians, are cut down in a cowardly attack, all citizens should stand up to express their disgust and solidarity,” said Hassan Bousetta, a local councillor in the city of Liège, who helped organise the march, told AFP. Bearing a banner marked, in French and Flemish, “#alltogether against hatred and terror,” the main group of marchers was led by families of the victims, followed by representatives from the various religious communities. A fire truck, its beacons flashing, symbolised the role of emergency services after the attack, fire service spokesman Pierre Meyes said. In the group that left Molenbeek, a group of children chanted, “Daesh, off you go, Brussels isn’t for you!”, referring to the Islamic State jihadist group, which is also known by the acronyms of ISIL or ISIS. 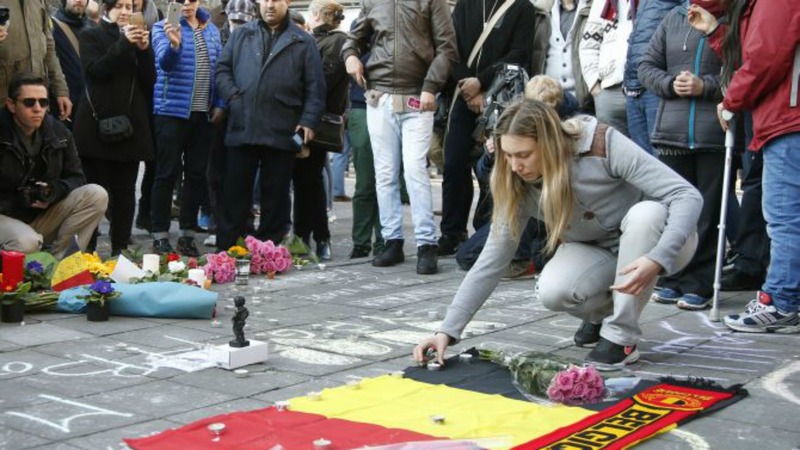 Thirty-two people were killed in the three March 22 bomb attacks, which targeted Zaventem airport and a subway train near the European Union (EU) institutions in central Brussels. The violence tore at Belgium’s social fabric, already weakened along linguistic lines between francophones and Dutch-speaking Flemings, and stirred anguished debate about the emergence of jihadists among the country’s Muslim underclass. On Saturday, Interior Minister Jan Jambon — who has been criticised for his handling of security — said a “significant section of the Muslim population danced” when the attacks took place. Jambon also accused Muslim residents of Molenbeek of attacking police during an operation last month to arrest a suspect in connection with the deadly attacks in Paris last November. “They threw stones and bottles at police and press during the arrest of Salah Abdeslam. This is the real problem. Terrorists we can pick up, remove from society. But they are just a boil. Underneath is a cancer that is much more difficult to treat. We can do it, but it won’t be overnight,” he said. The march, an initiative gathering more than 100 associations, was initially to have taken place on March 27, but was scrapped at the authorities’ behest for security reasons.